Janome 5812 doesn’t have a lot of features. In fact it even lacks some basic features that beginners need, it sews well nevertheless. 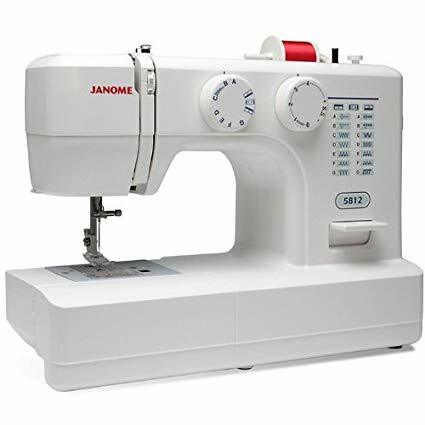 Janome 5812 is a classic looking mechanical sewing machine. The design reminds me of old mechanical sewing machines. The design is pretty simple and straight forward. The machine comes with 12 built-in stitches which includes a 4-step buttonhole. There are 39 stitch functions in total. It features an easy to use drop-in bobbin (honestly, I didn’t expect drop-in bobbin for a Janome machine of this price). Dials are provided for stitch selection and adjustments. Stitch width can be adjusted up to 5mm and stitch length up to 4mm. Auto de-clutch bobbin winder is a welcome addition. With the auto de-clutch bobbin winder, the needle will stop when the winder is engaged. Janome 5812 comes with an extra-high presser foot lifter, which allows you to sew multiple layers of thick fabric without any effort. Over-sized reverse sewing lever is conveniently placed and since the lever is very large, it will be easy for older people to use it. A manual thread cutter is also provided for easy cutting. The machine is capable of free arm and free-motion sewing. Janome 5812 doesn’t have a lot of bells and whistles. It definitely lacks some basic features that you normally find on modern sewing machines, but it does one thing well, it sews beautifully. The stitches are all nice and tight. There are no issues like jamming or breaking. The machine seems to hold up well with multiple layers of denim as well. It is a lightweight machine, so it is very easy to carry it around. The buttonhole stitches look good but the 4-step selection is pretty old fashioned. One thing to notice is that 5812 doesn’t have an automatic needle threader, so make sure you have healthy eyes before considering it. As I have said earlier, Janome 5812 lacks some basic features like 1-step buttonhole and automatic needle threader. These are default features that you get on all modern sewing machines. When you consider that, 5812 definitely feels like a step backward, especially for the beginners. 5 point box feed means, you need to pull the fabric from back to help it through. 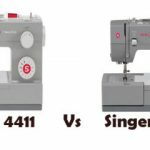 You can’t call Janome 5812 a perfect mechanical sewing machine as it lacks some very basic features. But if you are happy with what is on offer and all you worry about is the quality of stitches, then 5812 would not be a bad choice at all. 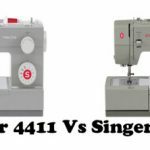 As a beginner I will always look for a mechanical sewing machine with 3 important features, the automatic needle threader, 1-step buttonhole and drop-in bobbin. These 3 features play a huge role in making a machine user-friendly. 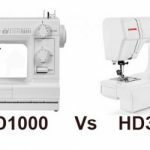 In that case, the best mechanical sewing machine from Janome that has all these 3 features is the Janome HD3000. But it is much more expensive than 5812 (almost double the price), but it oozes quality. It comes with 18 built-in stitches as well. 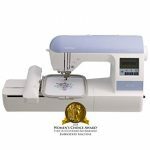 It has been voted by Sewing Machine Reviews as the Best Heavy-Duty Sewing Machine U.S. 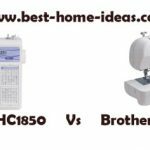 If you are really under a tight budget, Brother CS6000i is another alternative that comes in the same price range of Janome 5812. CS6000i is a computerized sewing machine with quite a lot of features like 60 built-in stitches, automatic needle threader, drop-in bobbin, needle position key, seven 1-step buttonholes etc. It even features in our list of ‘Machines You Can Buy With Your Eyes’, which is a testimony to its quality.